Income tax extension form enables the taxpayer to seek tax payment extensions from the income tax department by providing necessary details about tax to be paid. They also mention the tax extension requested amount, period and fiscal year details that are required for the tax department to scrutinize the extension applications. They also provide detailed instructions on how to file tax extensions and details of other related tax forms. One can find plenty of Tax Forms and samples from the internet. 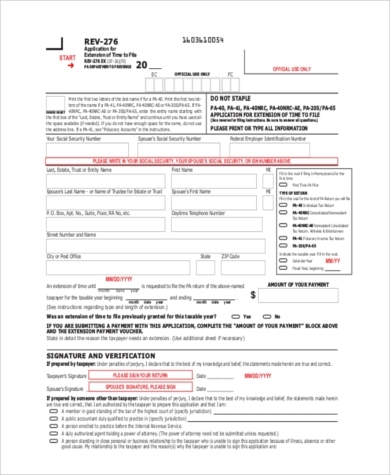 This income tax filing extension form presents the taxpayer name, home address, foreign country name and postal code, extension time requested and the reason for requesting extension time. It also presents the foreign country tax qualifying details and obtains the signature of the taxpayer. 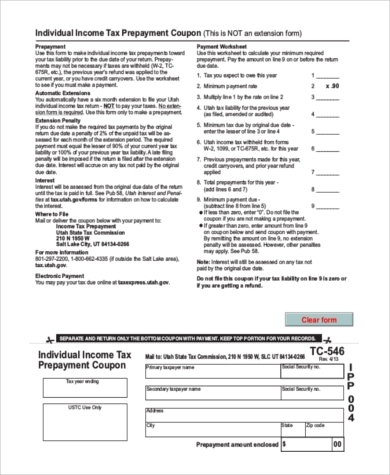 This income tax automatic extension form presents the taxpayer name and address, SSN, tax liability estimation and amount being paid. It also provides specific instructions to complete form 4868 and payment method details. 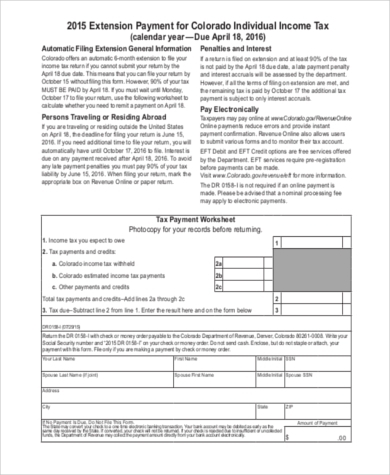 This federal income tax extension form presents the taxpayer’s SSN, spouse’s SSN, federal employer identification number, name, spouse name, address, requested extension date and taxable year. It obtains the signature of the taxpayer and provides instructions as well. 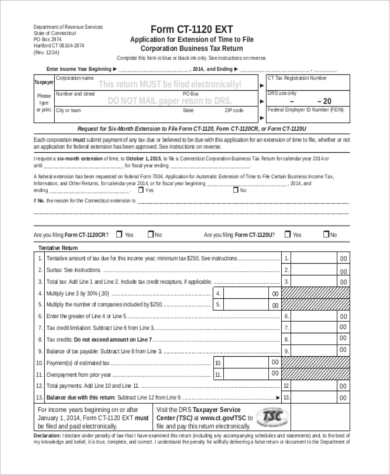 This corporate income tax extension form presents the corporation name and address, requested extension date, fiscal year, the reason for Connecticut extension and tentative tax return details. 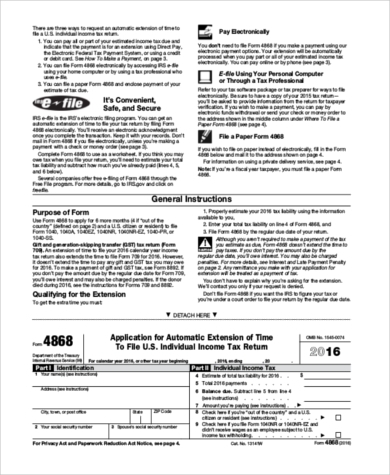 It also provides instructions for filing a tax extension. You may also see Federal Tax Forms. This extension payment for Colorado Individual Income tax presents the taxpayer name, SSN, spouse name, SSN and address as well as the amount of payment. It also presents the tax payments and credits that income tax owed. 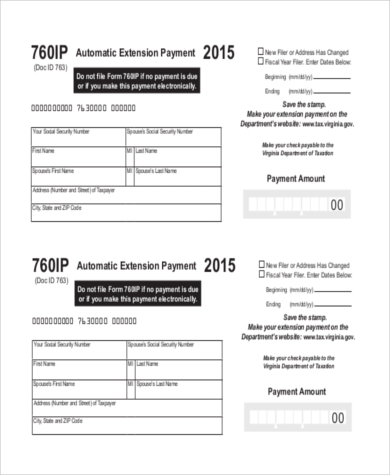 This automatic extension payment voucher for individuals presents the tentative tax computation worksheet, payment amount, tax preparer’s name and address, tax payer’s name and address, spouse’s name, SSN, and address. You can also see Tax Exemption Forms. This individual income tax prepayment coupon presents the details about prepayment, extension of penalty, interest, tax filing and electronic payment. It also presents the payment worksheet like tax expected to owe, minimum pay rate, minimum tax due and minimum payment due. What to Include in Income Tax Extension Form? 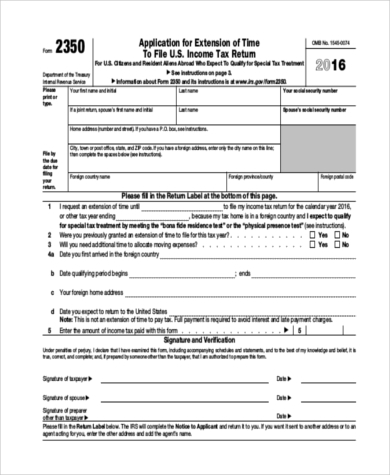 Income tax extension form contains the taxpayer name and address, SSN, extension period, expected tax amount and tax credits. They also provide tax payment worksheet, automatic extension details, where and how to file tax extensions. They also include details about prepayment, tentative return details, corporation officer’s name and address when applying for tax extension for the corporation. They should also mention the balance due and expected payment date. They should provide complete instructions to file extension, electronic filing methods, and payment options as well. They should also mention interest and penalty details. you may also see Tax Exemption Forms. What are The Benefits of Income Tax Extension Form? One can download the income tax extension forms that are available extensively on the internet by choosing the appropriate form and utilize them to file income tax extension. They come in PDF format which is printer friendly. They provide many varieties that are extremely useful to individuals, corporations, and businessmen to file tax extensions.